Pepi Bath is another cute Pepi Play app I use often when working on early language goals. This game comes in two versions - with a boy and a girl character. After selecting the preferred option, the child chooses among the following scenarios: doing laundry, washing face, going to the bathroom, or taking a bath. What a fu way to teach kids about hygiene! Where do we start? Does your child already know some basic body parts such as “eyes”, “mouth”, “nose”, “ears”, and “hair”? Think of one or two words that you think would be the most important (or the easiest ones to teach) and talk about them when playing the game. Make sure to pause for a bit to give your child the opportunity to say the word you have modelled. The goal is achieved when the child is able to both point and label the body parts you have been working on. Goal mastered? Then start teaching new, more challenging words (e.g., “scissors”, “sink”, “tissue”, “tap”, “comb”, “soap”, “faucet”). Describing words, or adjectives, are the words that describe nouns. Children with language delays/ disorders often have difficulties using adjectives. No need to wait until your child has mastered all of her/ his nouns and actions to introduce early descriptive words. Here are some examples of words you can practice within Pepi Play: “clean”, “dirty”, “messy”, “pretty”, “nice”, “long”, “short”, “white”, “soapy”,“sudsy”, “hot”, “cold”. Describing words are abstract, and not easy concepts to teach. Make sure your child understands "dirty", before teaching the word "clean". two-step instruction: “First wash Pepi’s hands and then brush his teeth”. Spatial terms, also called location words or prepositions, are the little words indicating the position of items. Some of the early prepositions children learn are “in”, “on”, "under", “behind”. Talk about where each item is and make sure to use several examples when teaching a new concept. “The toothbrush is IN the cup”. “The scissors are BETWEEN the soap and the cup." "The soap is on the counter”. Denitsa graduated from the Master’s program in Speech-Language Pathology at Sofia University, Bulgaria. In her practice, she has worked with preschool and school-aged children with a wide range of communication difficulties – speech (articulation, phonology, motor speech), fluency (stuttering), language, preliteracy and literacy skills, cognitive-communication (social communication, executive functions). Denitsa has completed the It Takes Two to Talk®and More Than Words®family-focused intervention programs designed for parents of children with language delays and social communication difficulties/Autism Spectrum Disoders (ASD). Additionally, Denitsa has received training in the PROMPT system(for motor speech disorders), DIR®Floortime Model (child-centered approach for children with ASD) and PECS (augmentative/alternative communication program for nonverbal or minimally verbal children). Denitsa incorporates new technology and uses an iPad in her sessions both as a way to support her clients’ communication needs and a tool for language learning. She provides assistance to parents in the process of selection of educational iPad applications for home practice. What is speech? What is language? These are questions I hear often when working with families, educators, and medical professionals so I thought it might be helpful to explain the difference. Speech refers to the individual’s ability to communicate verbally. Speech includes articulation, fluency, and voice. Articulation refers to the actual process of production of speech sounds. A child with a speech impediment has difficulties with the production of a certain sound (e.g., “R”, “L”, or “S”). Articulation errors are substitutions, distortions, omissions, and less commonly additions. An 8-year-old child who says: “The thun is shining in the thky” is using the sound /TH/ instead of /S/. This is an example of an articulation disorder which we call a frontal lisp or an interdental /S/. The therapy with this child is going to be directed at establishing a correct tongue placement for the sound /S/. Some children have difficulties using a group of sounds or patterns. A 5-year-old who says: “The tow dives milt” has not mastered the production of the sounds “K” and “G”. We call this process “fronting” (consonants "K" and "G", produced back in the mouth, are substituted by “T” and “D” which are produced in the front of the mouth). Fronting occurs in typical speech development, and is usually eliminated by the age of 4. Fronting is a phonological process. Another common phonological process is final consonant deletion in which final sounds in words are not produced (e.g., "do" for "dog"). Apraxia of speech is a rare disorder which affects the process of planning the movements of the articulators for the production of speech. Apraxia varies in severity. Kids on the severe end rely on augmentative and alternative communication to communicate. Many kids with apraxia develop typical speech. Fluency is the flow of speech. Stuttering and cluttering are fluency disorders characterized by interruption in the rhythm of speaking in the form of sound/ word repetitions, prolongations, and blocks. Voice is produced by the vibration of the vocal folds and breathing. Misuse of the voice can lead to changes in the vocal quality or loss of voice. effective use of language for communication requires a broad understanding of human interaction including such associated factors as nonverbal cues, motivation, and sociocultural roles. Receptive language (language comprehension) refers to the individual’s ability to understand others. Expressive language is being able to share one’s ideas through gestures, words, phrases, or writing. A speech-language pathologist working with a child with expressive language disorder aims at helping the child increase the number of words produced; generate words, word combinations or use more complex phrases; use grammatical markers. Following verbal directions, answering questions, identifying what pictures mean are common therapy goals for individuals with receptive language disorders. Game Review: Rush Hour Jr.
Thinkfun’s Rush Hour is a fun game in which children navigate through a number of parked vehicles to help the ice cream exit the parking lot. Although the rules seem quite simple, finding a way out is not that easy and requires strong logic and problem-solving skills. The game comes in a range of difficulties (beginner, intermediate, advanced, and expert). There is also an app version of Rush Hour. While this product is geared toward younger kids, I have also used it with older students and adults with TBI when working on executive functions. Working on the dreaded /R/? Rush Hour is an entertaining activity for children learning to produce this sound as many of the words within it contain /R/s. Playing a game is way more enjoyable than using flash cards! Another benefit of using games in articulation therapy is that we hear kids using natural speech (as opposed to the drill-like production in flash cards practice). Initial /R/ words: "red", "rush", "right"
/R/ blends: "green", "brown", "firetruck", "ice cream", "traffic"
Keep all cars in a bag and hold them away from you child. Have him or her ask for each one or practice talking about where each car goes. Depending on the stage they are at in therapy, kids are to use a single word, a phrase, or to use the/R/ sound in natural speech. Check out my blog post for more tips and strategies on establishing the /R/ sound. In speech therapy sessions, we often change and adapt games to address different treatment goals. I use a modified version of Rush Hour when working with children with communicative impairments such as ASD or developmental delays. Figuring out how to "rescue" the ice cream truck might be too challenging for children with significant communicative impairments, so instead we practice matching the cars on their parking lot to the one in the picture. Matching games are quite fun for kids with ASD, as they are visual learners. Manipulating all the cars on the parking lots requires fine motor skills, so here we go - we have now integrated the occupational therapist's goals in our activity! Kids who are not able to speak can play Rush Hour, too! I have used it with students working on phase 3 of PECS to construct their first "I want + phrases". Children using electronic devices can use the game as well. Make sure you spend a lot of time modelling words and navigating between categories hen working with students recently introduced to electronic devices (e.g., home page - transportation folder) to help them learn where words are located. In addition, while playing the game the child is going to receive many opportunities to familiarize himself/ herself with the vocabulary within the folder “transportation”, and learn that a “bus”, a “fire truck”, and a “car” are all “vehicles”. Yet another application of the Rush Hour game is when working on expanding the number of words used in phrases. For instance, a child who only says a word or two is encouraged to use complete phrases to request the different vehicles in the game (e.g., "I want the school bus"). Whether or not you choose to proceed with the modified version of the game would depend on the cognitive level of each child. The therapist holds the card while the student completes different instructions (e.g., “Put the firetruck in the top right corner of the parking lot.”, “After you put the firetruck down, take the school bus and ”, etc). Similarly, use “Rush Hour” to teach spatial terms such as “beside”, “under”, and “over”. Since spatial organizational is especially challenging for individuals with TBI this game can be used to work on these goals too. Finally, Rush Hour is an excellent reinforcer! Oftentimes, children receive the game at the end of our session. It is their award for their hard work. If I were to choose the game every speech-language pathologist loves, I would go with “Cariboo”. It is a treasure hunt game in which finding all balls is awarded with seeing a treasure chest opens. Unfortunately, this game is no longer manufactured, but it can be purchased on sites like eBay and Amazon. I did my happy dance (twice!) after finding mine in a neighbourhood second store toy store. There is a newer version of this game - "Cranium Cariboo Island"- which is almost as fun as the original one. Who is it for: Preschool-aged children (ages 3-6), but I have to admit I have used it with some older kids, too. Aim of the game: The goal is to find all the balls hidden under each door. Once this task is accomplished, the balls are rolled down a small tunnel. And as soon as the sixth balls goes down the slot, the treasure chest opens. Ta da! What's inside? What makes "Cariboo" so amazing? This is a game I can use in speech therapy sessions to work on so many different speech, language, and social interaction goals. And all kids love it! It's a total SLP bliss! Working on requesting? “Cariboo" is great choice to support this goal. First, we have to choose the words we are going to use to request. The word “key” works well as a target word since the child needs the key to open each door. There are lots of doors that we need to unlock, so the child will have many opportunities to practice requesting using this target word. Another word to use to work on requesting is “ball”. Note: The adult has to hold the balls, or there is no need to request anything! Once the child starts to independently use single words to request, you can start expanding his/ her utterances to short phrases (e.g., “I want the ball” or “I need the key”). You can also use “Cariboo” to teach your child to wait for his/ her turn and take turns with another person. Not necessarily an easy goal to work on, but well worth the effort. “Waiting” is especially difficult for children with Autism Spectrum Disorder (ASD) and developmental delays; however, it is an important life skill that everyone needs. Learning to wait is also important for the process of the maturation of the frontal lobe. The frontal lobe of the brain is responsible for executive functions (e.g., planning, organizational skills, attention to details, problem solving, etc). 1. Creating an expectation for waiting within the game. How long do I wait for? Your child will show how long he can wait for or take turns for. 2. Playing on your own with the child to start with. Making your little one wait for each family member to take their turn is not realistic early on, and will not end well. 3. Progressing quickly through the game. 4. Concentrating on taking turns. Forger all other language goals for now! 5. Following through, and finishing the game, even if the child is seemingly upset (of course, I don’t mean a full-blown tantrum). Remember: you control the pace of the game. Try to keep the pace consistent even though it might seem like the child is hardly sitting still. 6. Playing the game again and again while increasing the amount of time in between each turn. Everything going smoothly? Then it’s time to make tasks more challenging. There are couple of ways to do that: by introducing another family member or friend or having your child wait a little longer before taking her/ his turn. Another use of this game could be to help your child learn adding an /S/ for regular plural nouns (e.g., “cats”, “dogs”, “buses”). Regular plurals are among the first grammatical markers (or grammar words ) children acquire and are important as they carry important information. Typically developing children start using plural “s” sometime between their second and third birthday (27-33 months). Children with language delay and disorders often have trouble using plural /S/. 1. In the early stage, focus on teaching the contrast between a singular and plural noun. Say each word and exaggerate its ending as you play together (e.g., “Oh, look, it’s a cameL”, “Let’s open the busES. I see three busES). Sometimes all it takes is to “hear” the difference! Make sure the child understand the difference between a “book” and “books” before moving to the next phase. 2. In the next phase, the child is going to be expected to use plural /S/ in her/ his sentences while playing the games (and in no other situations). I try to be as gentle as possible when correcting children’s production. Simple modelling correct production or using statements such as “Oh, I think you meant ”applES”. I see two applES.” works better than telling them they were wrong or asking them to repeat. 3. Once this phase is mastered, you will have to monitor the ability of the child to use plural /S/ in natural speech. It usually takes a few months before the child start using this grammar concept spontaneously in natural speech. Technology’s changing our lives and has given us the means to do what was thought to be impossible - to give voice to others. In this video, Stephen Hawking, discusses his new communication system with a BBC journalist. Stephen Hawking is an AAC user. ASHA’s definition: "Augmentative and Alternative Communication is Augmentative and alternative communication (AAC) includes all forms of communication (other than oral speech) that are used to express thoughts, needs, wants, and ideas. We all use AAC when we make facial expressions or gestures, use symbols or pictures, or write." Smiling when talking to a friend, inserting an emoticon when sending a message, raising shoulders to express uncertainty are all examples of AAC. AAC systems are designed for individuals who are not able to use functional speech temporarily or permanently. For example, a child might use a low tech system while his/her speech and language is developing. When an AAC system is put in place permanently, it is seen as the individual’s primary method of communication throughout his/ her life. Additionally, AAC systems are sometimes appropriate to supplement individuals whose speech is difficult to understand. In these cases, verbal speech remains the main method of communication, and AAC system is only used as a means to clarify communicative breakdowns. Most often, Augmentative and Alternative Communication is prescribed for children with acquired communication disorders such as Autism Spectrum Disorders, Cerebral Palsy, Down Syndrome, Developmental delay, Apraxia of Speech, which result in significantly compromised communication skills. Some individuals with acquired conditions, like stroke for example, result in loss of communication skills later in life, and may also be candidates for AAC. Individuals suffering from progressive disorders (e.g., Amyotrophic Lateral Sclerosis, Huntington’s Disease) may also benefit from AAC. The process of selection of communication system is the combined effort of a team of professionals: a speech-language pathologist, an occupational therapist, a physiotherapist, a physician, an engineer, a vision specialist, a learning specialist as well as the AAC user and her/ his family. Unaided Communication Systems - rely only on the individual’s body to convey the message. Gestures, sign language, and nonverbal communication are all examples of unaided systems. Aided Communication Systems - rely on additional materials and/ or equipment to convey the message and involves visuals, communication books, and speech-generating devices. The biggest advantage aided communication systems have over the unaided ones is in the transparency of their messages. Everyone knows that a red stop sign means we have to stop, whereas only a limited number of people know sign language and understand the meaning each sign represents. Studies show 30-50% of all children with ASD don’t develop functional speech. Many children with developmental delay also rely on AAC to communicate. AAC provides a way for individuals to participate in routines, games, and learning. The relationship between behaviour and communication has been well documented in the research literature. Therefore, it should not be surprising that the implementation of AAC systems often leads a decrease in maladaptive behaviours (e.g., screaming, hitting, pinching, etc). AAC systems support the development of expressive, receptive language, and speech production skills. AAC systems can be adapted to match each child’s cognitive and language level. There is no expectation that children would need a certain set of skills in order for AAC to be introduced. Through AAC systems, children severe expressive language delays can be introduced to grammar and literacy at the same age their peers learn these skills. Millar, D., Light, J., & Schlosser, R. (2006). The impact of augmentative and alternative communication intervention on the speech production of individuals with developmental disabilities: A research review. Journal of Speech Language Hearing Research, 49, 248-264. What is PECS (Picture Exchange Communication System)? PECS (Picture Exchange Communication System) is the brainchild of psychologist Dr. Andy Bondy and speech-language pathologist Lori Frost. The system, developed back in 1985, brings the best of both worlds, and is among the first augmentative communication systems for individuals with severe communication disorders. It’s amazing how much the field of AAC has developed since then. PECS is a highly-structured behavioural program, based on the principles of Skinner, in which very attempt for communication is rewarded by receiving a motivating item or activity. PECS is a low-tech augmentative communication system. Who is it for? The system is appropriate for non-verbal or minimally verbal individuals of all ages who show little motivation to communicate with others. There are six phases of PECS. The amount of time spent on teaching each phase depends on the individual characteristics of the child. The first phase of PECS aims at teaching the student the physical aspect of the communication exchange. 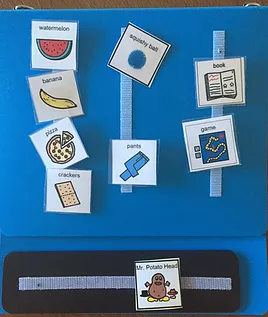 One adults sits in front of the child, holding the “reinforcer” (the motivating item), and another person, the “prompter”, sits quietly behind the child to help the child reach for the picture. When seeing a motivating item, the student selects a picture of the item and passes it to the communication partner. The reward is receiving the desired item. Note: The child is not required to scan and look for the appropriate picture in Phase 1. There is only one picture presented to him/ her. For this phase, the child learns to be persistent in his/ her attempts to communicate. The communicative partner starts walking away slowly from the child, thus, encouraging the child to make the physical attempt to obtain the motivating item. Alternatively, the pictures can be placed some distance away as well. The “prompter” is present during Phase 2 to provide guidance to the child, if needed. In PECS’s third phase, children are taught to discriminate between pictures. At first, they are presented with two pictures: preferred and non-preferred items. This is how children learn to pay attention to the pictures - if they are not careful, they end up with an item they really don’t like! As with the other phases of PECS, there are very specific instructions as to how to progress through the stage as well as error correction procedures. Once Phase 3 is completed and children are able to independently choose pictures of items they need, they are ready to start generating short sentences. The visual “I want” is now added to the PECS book to support the development of this goal. When the child passes the sentence strip to the adult, he/she is expected to point to each word before receiving what is wanted. Some kids start talking (usually a few words) during Phase 4 when labelling motivating items. At this stage, children are also introduced to attributes (and some other words), and are shown how they can expand their phrases. The goal of the first four phases is spontaneous requesting. The range of communicate functions is expanded in phases 5 and 6, where children learn to respond to questions and make comment. The goal of this phase is answering “what do you want” questions. This might be a stage that you might not get to as kids are usually transitioned to electronic devices once they demonstrate the ability to request spontaneously. Phase 6 is about teaching children to respond to “what do you see?” questions. The new visual “I see” is added in the book. Children might initially be confused and use “I want” symbols to comment. It takes some times to master the last phase, and it is very important to follow PECS guidelines for error correction when working on this goal. PECS is an excellent choice for individuals who show no desire to interact with others. Some individuals develop functional speech while using PECS. PECS is not a complete language system. PECS is not appropriate for individuals who show interest and motivation to communicate with others. Overall, PECS is a great system for kids who show little interest in social interaction. Being successful in getting their message across is an important first step for these kids, and might motivate them to explore other forms of communication, including verbal speech. Hearing your child struggle when trying to get the words out is a painful experience for each parent. But is it a true stuttering? Young kids often go through a period of "developmental stuttering" as they learn to use new words and sentence structures. These disfluencies are associated with this period of rapid language growth. Guitar states that 75% of these children recover without intervention. When does your child need to be seen by a speech-language pathologist? What does stuttering look like? Stuttering and cluttering are fluency disorders characterized by interruption in the rhythm of speaking in the form of sound/ word repetitions, prolongations, and blocks. Disfluency is another word for stuttering. There are three basic (or primary) speech behaviours associated with stuttering: repetitions, prolongations, and blocks. Repetitions are the most frequently observed of the three. They are most evident when a person initiates speaking and come in the form of a single sound, syllable, word or phrase repetition. "I I I I I want to go outside to park with dad." Prolongations are characterized by uneven duration of sounds in words (e.g., some sounds are last longer than they should). "Wwwwwwe were playing inside because it was raining." Blocks are another core stuttering behaviour. The individual tries to say something, but appears stuck and is unable to produce the word. "I am looking for my....keys." Secondary behaviours are physical manifestations (e.g., eye blinks, tension in the upper body, tremor of the face, etc.) of stuttering which develop over time as the awareness of the individual of his or her difficulty increases. The speaker is using these behaviours when anticipating a period of stuttering. Interjections are avoidance behaviours typically observed in older kids or adults who have had a fluency problem for some time. Interjections are used to "mask" the stuttering. Sometimes inserting little words like "um", "uh" or ''hm" helps them find a word which might be easier for them to say and avoid a moment of stuttering. "Um I am going to call um my friend um Nora to see if she wants to see the movie with me." Stuttering is a difficult disorder to treat for many reasons. One of its most perplexing features is its unpredictable nature - it comes and goes, only to return in a few days, weeks, months or even years. Nobody can predict how long the stuttering will last for and when it will disappear. Along with the most obvious characteristics - the primary and the secondary behaviours - speech-language pathologists also have to address the feelings of each individuals who stutters. Some kids are very sensitive to the way they sound and might choose to avoid speaking situations due to their fear of stuttering; others seem not to notice their problem and show little motivation to participate in therapy. Despite all challenges, I believe that even the most severe stuttering can be overcome. "Once a stutterer, always a stutterer" is an erroneous statement. We now know a lot about stuttering and the success of many of the excellent treatment programs have been documented. All it takes is some patience, persistence and determination. And a great therapist like Lionel! Guitar, B. (2013) Stuttering: An Integrated Approach to Its Nature and Treatment. Indirect language stimulation techniques are powerful, child-centered strategies to use with your kids to help them learn language. They are appropriate for ALL children (typically developing and those with communicative impairments), and can be used in many different environments. The focus is on the child’s interest and what he/ she is doing, seeing, and feeling. Indirect language stimulation does not pressure the child to provide a response. Instead, the adult uses simple, short phrases to describe each action or object while interacting with the child. This helps the child learn the language she/ he will need later to participating in the same or similar game. There are a number of indirect language stimulation techniques, and they are all interesting and worth mentioning. In this post, I will review self-talk, parallel talk, expansion, expansion plus, and recasting. In self-talk, you talk about what you are doing as you are performing an action. The focus is on the action you are in the midst of doing. Essentially, you are pairing your words with the actions, thus providing an excellent model for your little one(s) to learn language. These strategies can be used in many different settings: at the grocery store, at the park, at home (e.g., cooking, playing together, doing chores together). It is important to use short, grammatically correct sentences when you talk to your toddler. The difference between self-talk and parallel talk is that in the latter you take the perspective of the child. How to use: Use on its own or pair up with another indirect language stimulation technique. In my speech therapy sessions, I often use self-talk and parallel talk in the same activity. With this strategy, you add to what the child is already saying, making it sound more like how you would have said it. Adult: "The baby is crying." How to use: Expansion works great for toddlers who are learning to combine words. This is a technique I use every day in my practice. It does wonders! Like in the indirect language stimulation technique which was described previously, the child’s utterance is expanded to make it sound like the adult model. What is different here is that we also add additional information. The focus is on the objects the child's engaging with. Take a moment to observe and listen. What does she/he seems interested in at the moment? Use short phrases to describe what the child is seeing. "This is a big ball." How to use: I usually use description with kids who already have a fairly good vocabulary. What I like about it is that it provides opportunities to teach a bit more advanced words: e.g., feelings, adjectives, etc. Recasting helps correct grammatical mistakes in a noninvasive way. Instead of pointing out what the child is doing wrong, we provide a model of what he/ she should be saying. I am sure you are already using some of these strategies when playing with your toddler. Which ones do you think would be most beneficial for your child? Planning to see the indirect language stimulation techniques in action? Remember: there is no need to bombard your child! Choose one or two of the strategies and spend some time in preparing they will be implemented in play. It might help to jot down some phrases before you start using them with your child. In order for the “teaching” process to be effective, you will have to dedicate some time to it. Spend 10-15 minutes each day playing while using the strategy. It might take a few weeks to see the effects, but it’s all worth it! The Topanifarm Cubes, manufactured by the French company Djeco, are cute blocks for infants and toddlers that I use on a regular basis in my speech therapy sessions. The Communication Clinic is a dedicated group of professionals who provide speech and occupational therapy for your tots and teens. We are located in Bloor West Village and offer a wide range of in-clinic or in-home services for children in Toronto and the GTA. ©2017 The Communication Clinic. All rights reserved. Powered by Squarespace.